At Tripoli —Part I – Fix Bayonets! The brevity of the refrain leads people to think that at some point, Marines stormed ashore at some place called Tripoli. My guess is that most high school graduates, along with 85% of all college graduates, have no idea where Tripoli is—or even what happened there. It is more complex than most think. The practice of state-supported piracy was a common practice in the 18th and 19th centuries. One may recall that the fledgling United States went to war for a second time with Great Britain because the British navy accosted US flagged ships and impressed their crew to serve involuntarily aboard British ships of the line. Additionally, European maritime states hired privateers to attack each other’s shipping. The decision of Great Britain and France to pay tribute to the Barbary pirates encouraged the scallywags to increase their piracy —which benefitted England and France through less competition in the Mediterranean. And, of course, the navies of England or France were not the huckleberries a pirate vessel would want to challenge. Before American independence, extortion along the North African coast was not an American problem. We were then a colony of Great Britain; the problem was theirs. After independence, American shipping enjoyed no protection whatsoever from either England or France. 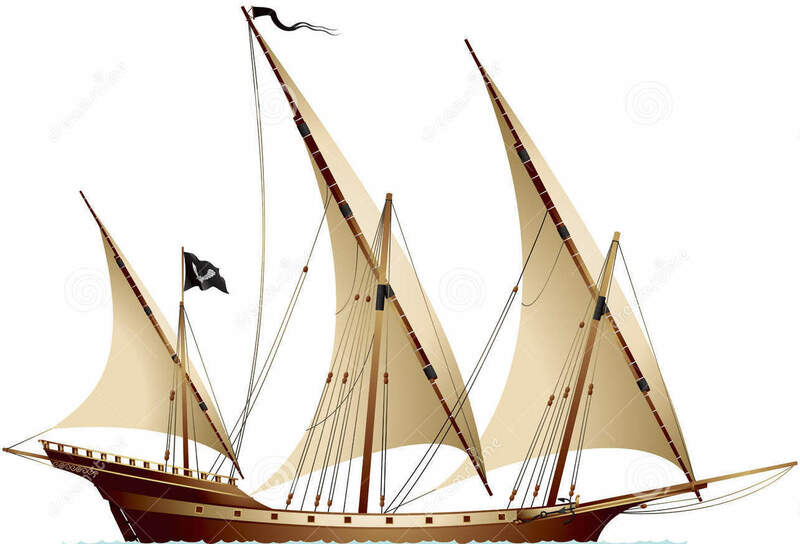 After independence from Great Britain, our English cousins were quick to inform the Barbary Pirates that they could avail themselves of American shipping at their leisure. It didn’t take long; in 1785, Dey Mohammed of Algiers declared war on the United States and captured several of our maritime vessels. The financially troubled confederation was hardly in a position to pay exorbitant ransoms for the return of ships or ship’s company. Nor could the Americans raise a navy —or pay tribute. The United States attempted to negotiate with the pirates. The Barbary States consisted of several North African states. Morocco, an independent kingdom, seized a US merchant vessel in 1784 after the Americans ignored their diplomatic overtures, but once the US acknowledged Morocco’s strategic position, negotiations progressed smoothly and productively; by 1786, a trade agreement did exist between the US and Morocco. Algiers, on the other hand, assumed a belligerent, condescending tone in demanding tributes that the United States simply could not afford. In an effort to circumvent Algiers, the US Minister to France attempted to establish a coalition of weaker naval powers to defeat Algiers. In this, our minister was unsuccessful; his name was Thomas Jefferson. However, Portugal was also at war with Algiers. It’s navy was strong enough to block Algerian ships from sailing past the Straits of Gibraltar an so for a time, American merchantmen had safe passage. A brief Portuguese-Algerian peace once again exposed American merchant ships to extortion in 1793. The efforts of diplomats sent to North Africa in 1795 concluded treaties with Algiers, Tunis, and Tripoli. The treaties agreed to pay tribute to these states, and the treaty with Algiers resulted in the release of about 80 sailors. It wasn’t until after ratification of the US Constitution in 1789 that the federal government had the authority to levy taxes and raise and maintain an armed force. When Algiers seized American ships in 1794, Congress authorized the construction of six ships for the U. S. Navy. In 1797, William Eaton (a former Army officer) was appointed Consul General of the United States. President Adams sent him to Tunis to negotiate peace and trade agreements with the governor (Bey) of Tunis. Tunis was the closest neighbor to Tripoli and the place of exile of the former Pasha of Tripoli, Hamet Karamanli (the elder brother of the reigning Pasha Yusuf Karamanli). While in Tripoli, Easton devised a plan whereby the United States would support the restoration of the deposed Pasha. This, Eaton argued, would garner respect for the United States throughout the Mohammedan world. Eaton had no support for his plan in Philadelphia. Meanwhile, the Bey continued to demand tributes and Eaton refused to convey any of his demands to the US government and the Bey of Tunis ordered Eaton to leave his country. Hamet Karamanli fled Tunis for Egypt. In 1801, the Pasha of Tripoli sought to punish the United States for its failure in making timely payments of tribute; he demanded higher tributes and polished off these demands by declaring war on the United States. Algiers followed suit. 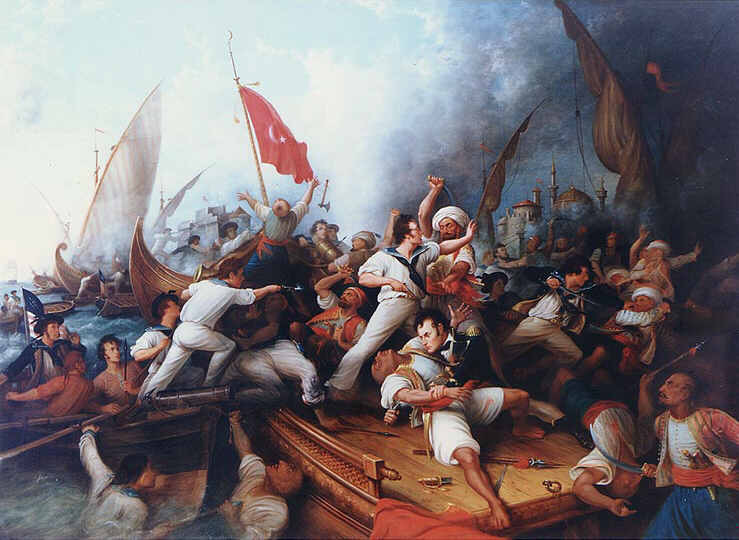 This was the first Barbary War; it was fought between 1801 and 1805. The First Barbary War began during the presidency of Thomas Jefferson, who refused to pay the Barbary States any tribute at all. Aligned with the United States was the Kingdom of the Two Sicilies. In sending a squadron of ships to the Berber Coast, it was Jefferson’s intention to block the harbor at Tripoli and force the Pasha to capitulate his position. Command of the squadron went to Commodore Richard Dale. The squadron consisted of Dale’s flagship USS President, commanded by Captain Samuel Barron, Lieutenant Stephen Decatur in command of USS Essex, Lieutenant William Bainbridge in command of the USS Philadelphia, and Lieutenant Andrew Sterett in command of the USS Enterprise. En route to the North African coast, Dale encountered adverse winds, delaying his arrival at Gibraltar until July 1, 1801. There he learned Tripoli had already declared war on the United States and that there were two Tripolitan warships of sizeable consequence berthed at Gibraltar. Their captains claimed they had no knowledge of the war. Dale made the assumption that they were about to embark into the Atlantic to prey on American shipping. Dale ordered the Philadelphia to remain behind and guard the enemy vessels. On August 1, 1801, Enterprise soundly defeated the 14-gun corsair Tripoli. 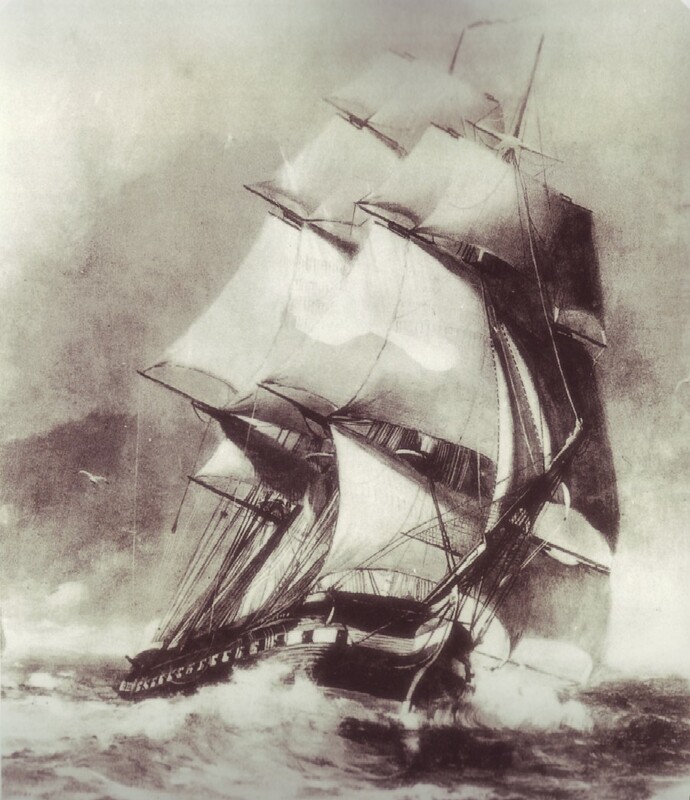 In 1802, President Jefferson received a Congressional mandate through “An act for the protection of commerce and seamen of the United States against the Tripolitan cruisers.” The act permitted the United States Navy to seize vessels belonging to the Pasha of Tripoli with the capture property distributed to those who brought the vessels into port. In 1803, the question remained unanswered; while the US Navy went unchallenged at sea, the Tripolitans had not capitulated and a state of war continued to exist. Jefferson increased the US Navy presence along the Berber coast. The squadron of ships was increased to a fleet, which now included Argus, Chesapeake, Constellation, Constitution, Enterprise, Intrepid, Philadelphia, and Syren (later, Siren). The capture and firing of Philadelphia and the repatriation of the members of its crew held on board motivated President Jefferson to send Consul General William Eaton, who was known for his brash and defiant diplomacy, back to the Berber Coast in 1804, this time on a military mission. In May 1804, Eaton was commissioned a U. S. Navy lieutenant and placed under the command of Commodore James Barron. He was ordered to find Hamet Karamanli, enlist his cooperation in the war, and free 300 American hostages in Tripoli. This would become America’s first clandestine mission designed to overthrow the head of a foreign government. Eaton located Karamanli in Alexandria and signed an agreement with him to provide cash, ammunition, and provisions in the prosecution of war against his brother, and re-installation of Karamanli as the lawful ruler of Tripoli. In order to ensure American command and control of this operation, Eaton’s agreement with Karamanli also designated Eaton as “General and Commander in Chief” of the land forces that would be used to make the attack. The agreement defined the relationship between Eaton and Karamanli, but the US Senate never ratified it. Eaton’s land force consisted of himself in command, assisted by Navy Lieutenant John H. Dent (later replaced by Midshipman George Mann), a force of 400 men (38 Greek mercenaries, 25 European artillerists, 90 armed men in service to Karamanli directly, 190 camels and their drivers, a small force of Arab cavalry, and eight United States Marines commanded by First Lieutenant Presley Neville O’Bannon. Eaton and Karamanli made the 600-mile march to Derne through the Libyan Desert from Alexandria, Egypt. Military professionals today continue to wonder what prompted Eaton to take on this forced march without a single map to guide him. Numerous challenges presented themselves to Lieutenant Eaton over the period of fifty days it took him to cross the Libyan Desert, not the least of which shortages of food, threatened mutiny by Arab factions, squabbling among Christians and Mohammedans, and the physical struggle of march across loose and packed sand in sweltering heat. Lieutenant Isaac Hull commanding the USS Argus was able to resupply Lieutenant Eaton at the Gulf of Bomba —but it was a close call. An eight-hour battle thus unfolded. Three American Navy frigates began to support Eaton by pounding away at Derne’s guns in the harbor fort, and these were eventually silenced. From then on, as in common in battle, the fight became a one-minute to the next affair. Hamet’s cavalry bogged down when it assaulted a determined outpost and Lieutenant O’Bannon and his contingent staggered under a murderous musket defense. Eaton rushed reinforcements to stiffen the assault, but a stalemate developed. The situation was desperate for the attackers; time was not on their side. Finally, Eaton decided that it was time to swim or sink. With sword extended forward, he led a charge —a gamble that paid off while outnumbered ten to one. The battle wasn’t over. 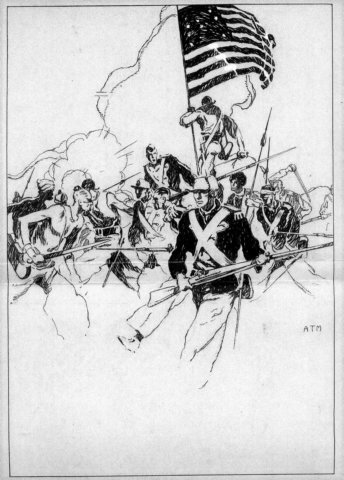 The Marines engaged in bitter street fighting; every yard contested—but eventually the Marines secured the fort and Lieutenant O’Bannon raised the US Flag —signaling America’s first victory on foreign soil. Two Marines paid the ultimate price: John Whitten and Edward Steward lay dead. Their bodies were laid to rest in Derne. The victory of Derne was short-lived. On the next day, the Pasha appeared with reinforcements and the town was soon surrounded. For a month, Eaton held out against a force easily three or four times that of his own. During this time, there were constant skirmishes and raiding parties keep everyone on edge. The Pasha made a last furious attack on June 11, 1805 ripping apart Hamet’s cavalry. Charge, counter-charge went on for four hours; eventually Hamet’s forces proved the better and the road was finally open to Tripoli. On June 12, 1805, the USS Constellation arrived to inform Eaton that he and his Marines were no longer needed: the United States had successfully concluded a treaty with the Pasha. Eaton was ordered to take Hamet with him, and the rest of the army was abandoned. The directive confirmed for Hamet that the Americans could not be trusted to abide by their agreements. It may be true that some Marines made it to the shores of Tripoli —but it wasn’t Lieutenant O’Bannon or any of his handpicked squad of deadly riflemen. Yet if there is anything that can be said about the Barbary Wars, it is that American diplomacy is amazingly consistent —and incompetent. I do not know what Dale’s orders were beyond “guarding” the Tripolitan ships; if they left Gibraltar, was Bainbridge to attack them? When me and my family were at the Colombus Zoo, they had some exihibit about pirates and all the little kids were flocking around, thinking they were so cool. We’ve never liked pirates (or in that case, respected) so we stayed away. As we were leaving, my dad jerked his thumb back at the statues of the pirates and said, “Those are the types of guys Marines take care of.” I couldn’t help grinning and grinned again as I read your article. Thank you! Thank you for your comment, Sam … I enjoyed it a great deal. I’m glad to see that you stop by frequently. I appreciate it. Yeah, don’t change a thing. Keep the song the way it is. Do you know why trade with the area was important to us in the late 1700s/early 1800s? Thank you, Mr. Gray. Forgive my long response, but this is my understanding: American merchant ships had been sailing and trading with Mediterranean interests since the Seventeenth Century—when the Americans still had the protection of the British Navy. Southern Europe wanted North American cod, grain, and naval stores. The American Revolution disrupted these shipping patterns for more than ten years. The Navigation Acts disallowed shipping Mediterranean goods to Great Britain within any American hold. The British were squeezing America with every hope that the emerging nation would fail. If we had to find a way of describing the American economy after the revolution, it would likely boil down to “financially stressed.” Former colonies could trade with one another, of course, but internal trade would not help the Americans pay off their war debt. The articles of confederation did not provide much opportunity for a central government to build or manage a national economy. In essence, we had thirteen independent states cooperating whenever they believed collaboration was in their best interest —which was not often. America’s new government did not have the authority to impose taxes. Lacking the ability to compel states to abide by centrally managed foreign trade there could be no viable and reciprocal trade agreements. Here is what the US government could do: it could print more money, and it could ask to borrow money from foreign governments. None of the founders thought that either of these was a good idea. Besides this, who in their right mind would loan the US government millions of dollars? Our first economic treaty was an agreement with France in 1778; twenty years later, our relationship with the French was not quite so cordial. The French nearly bankrupted themselves helping us during the Revolution —what did it gain them beyond a revolution of their own? Then, of course, we did become a bit snippy about all that property France still owned in North America. Every founding father seemed to understand that amicable trade agreements were as important to the stability of our emerging nation as the Declaration of Independence was; a nation incapable of managing a robust trade relationship with other nations is a nation that was not totally free and independent from our prior circumstances. Moreover, there was great emphasis placed on reciprocity. As for the Mediterranean (and elsewhere), Great Britain was in the process of creating a commercial shipping monopoly. 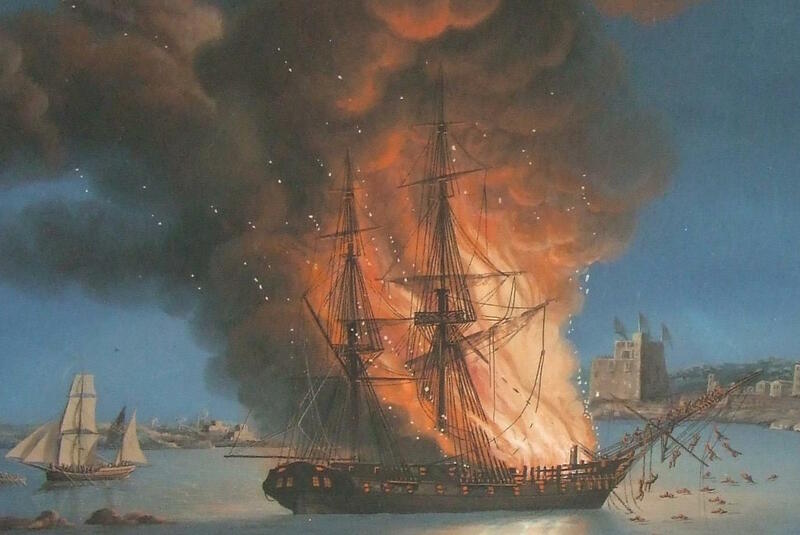 The entire purpose of hiring privateers was to upset French, Spanish, Italian, and American shipping —including the encouragement of Barbary depredations. In addition, if the British could get away with the impressment of entire crews of the ships accosted at sea, they achieve a robust naval and maritime balance at the absolute minimum of cost to themselves. On our side of the coin, American merchantmen played fast and loose with the rules of mercantilism. We ignored restrictions imposed by the British, French, or Spanish, and we acted as if their spheres of influence were simply manifestations of their over-active imaginations. Even before the revolution, Jefferson supposed the Americans had a natural right to trade freely with all parts of the world, not subject to the edict of any kingdom. His attitude in this regard did not change when he served as our Ambassador to France, or as Secretary of State, and certainly not as President of the United States. So, Americans barged in to the Mediterranean as if completely oblivious to old-world protocols or imperial restrictions imposed by the three masters of the sea, and did so because there was a high demand for American products within the Mediterranean area, and because Americans had a limited range of options. Very good. Thank you for taking the time to put this together. Once again, I know a lot more than I did a few minutes ago. Thanks. Great story. I know this incident – and period – decently well. As usual, you have added to my knowledge and understanding of the subtleties – like with this: “their piracy … benefitted England and France through less competition in the Mediterranean.” Never thought of that before! Much like modern big corporations who back stifling regulations to put their smaller competitors at a disadvantage. For more on those held in captivity in North Africa, I highly recommend White Gold: The Extraordinary Story of Thomas Pellow and North Africa’s One Million European Slaves and Sufferings in Africa. But don’t let Kid read the latter or the conniving lies and deceit of the ‘business-as-usual’ Mohammedans will diminish his view of that part of the world, if such a thing is possible. It’s subtitle is The Astonishing Account Of A New England Sea Captain Enslaved By North African Arabs. Before I order this book,will it piss me off? The first one (White Gold) more than the second one (Sufferings). It’s said that Sufferings, along with Uncle Tom’s Cabin, were the two most influential works on slavery that Lincoln read. Sufferings is circa 1817. It shows you how the Berber nomads operated in opportunistic slave commerce (probably still do) as a New England merchant’s ship foundered right off the coast. Much of the crew is lost forever to the salt mines of the Sultan, but in both books we learn how much they used enslavement as hostages for ransom. This was BIG BUSINESS in Islamic North Africa for centuries. The captain knew this, and played his cards very carefully to gain his freedom. The other is a century earlier, and it will majorly tick you off. This fellow was a slave in the sultan’s service in court and the misery he endured and saw for over 2 decades is almost past description. I better not read it. I’ve recenltly discouvered how to build nukes in the basement. After writing that, you shouldn’t have to worry about security for the neighborhood, Kid. You have more FBI and ATFE agents keeping an eye on your place than they have secret service at the homo house. An incredibly fascinating series once again. Yes, of course, I know we’ll of your Hymm…but like the millions of other Americans, I never knew about “…Shores of Tripoli”. The trek across the desert as described was unbelievable. I think about the stress of those 50 days: the language barriers, harsh conditions and boring landscape day after day… and for Easton to lead them under these conditions. It’s a wonder he wasn’t attacked. Plus, the reading of the Essex, Intrepid, Enterprise was enriching. Such history! So Tripoli was the first foreign soil upon which our flag was raised… and as you said, why we continue to negotiate with such countries confuses me to no end. Like you, I am convinced that we’ve been dicking around with these people for far too long. It is well past the time to make a lasting impression. I fear this is not likely however with the morons America has been choosing to lead (and I use that term with great reservations) them. I find it even more unbelievable that our Marines have to walk through poppy fields and not torch them because it is their livelihood. This even adds to my confusion as to why we are there…and why so many good young Americans had to die. Easily one of the brightest gents I’ve had the good fortune to meet in my life, Mustang, makes most academics appear to be only semi educated. I rather expect that one of the chief reasons is that he does deep research while most professors of history do not. It would seem that “home schooling” certainly worked for him…though being self-motivated, highly disciplined and really interested in learning has made him the brightest guy I know…but I repeat myself. I enjoin those who agree to emplore Mustang to save his writings…on many issues…and at minimum, bind them so others might read them in years to come. Note: I am not Mustang’s agent, nor a blood relative. I stand to gain nary a farthing from extolling his virtues….one of which being tight fisted with his hard earned swag. Sir: I will have you know that I would be happy to pay you one-quarter of a penny (farthing) for extolling my virtues. All we have yet to work out is whether the farthing comes per day of service, every week, or paid monthly. Please advise so that I can instruct my accountants appropriately.